I've been traveling quite a lot lately, and being summer, I'm betting that a lot of you have been taking some vacation time as well. I hope you are anyway. I've gotten pretty good at packing because my husband does not like it when I check a bag. So it's 3 fl oz and under for me when I travel when it comes to my beauty lotions and potions. So, I might have to sneak some of my things into his little perfectly sized travel bag, yeah, yeah because I do bring a lot. But I have definitely found some perfectly sized travel beauty products that I wanted to share just in case you needed a little help. One great place to start is the little maze you head down before checking out in store at Sephora. This little section is filled with great cubes of travel sized beauty products in the perfect sizes for traveling. I find these to be much more generous than the sizes you get in the trial size aisle of the mass or drugstores. These are usually full 3 oz sized products (what the TSA allows in your 1-quart sized bag, see above). I also sometimes order things from 3floz.com. This shop exclusively carries travel sized products and they have a lot of different brands. 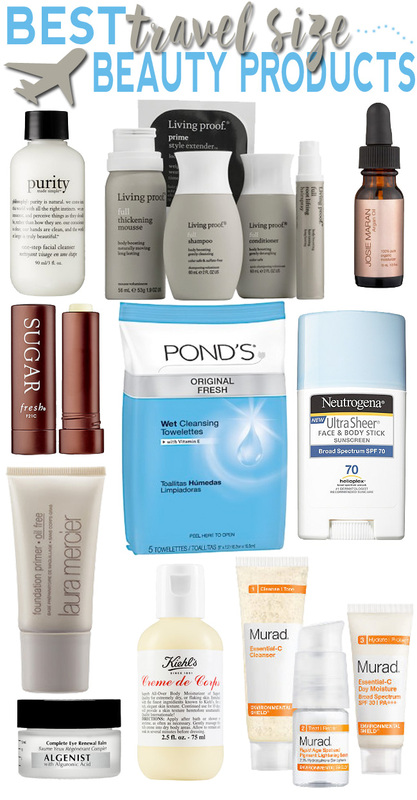 Here are my favorite top 10 travel size beauty products. 1. Philosophy Purity Made Simple One Step Facial Cleanser - I am so happy that the brand makes this in a small 3 oz. size. This is always in my travel bag as it's my go-to cleanser. 2. Living Proof Full Volume & Body Boosting Travel Kit - Travel sized shampoos are tough. The sizes in the drugstore are too small and are watered down. This shampoo and conditioner are larger sized and you need a lot less actually because of how they are formulated. I really like them. In this 5-pc kit you get them, plus a travel sized mousse (which is so hard to find) plus a few other goodies to round out the kit. I honestly only take the shampoo, conditioner and mousse with me but that is more than worth the price of this kit. The products are great for adding volume. 3. Josie Maran 100 percent Pure Argan Oil - I use this every night before bed and it's especially good for traveling on a plane when skin is extra dehydrated. This small .05 oz size is perfect for taking on a plane and is more than enough for a 2 - 3 week trip. 4. Fresh Sugar Lip Treatment SPF 15 - I don't travel anywhere without this lipbalm, and the fact that is contains sunscreen is a plus. I always get confused as to where to pack lipbalms and lipsticks. Is it considered a liquid or gel? I don't consider it one so I've always placed it in my actual makeup bag in my carry-on and I haven't been told otherwise. 5. Pond's Original Fresh Wet Cleansing Towelettes - I just like how these work on my skin for removing makeup at the end of the day. I find them at the drugstore and Target in smaller 5 and 15 towelette packs. When I do, I stock up. 6. Neutrogena Ultra Sheer® Face + Body Stick Sunscreen SPF 70 - Again, I consider sticks a solid a safe to pack, so for sunscreen when I travel, I always go with this one and then pick up a spray or anything else when I am at my destination. 7. Laura Mercier Foundation Primer - I love that this comes in a small, travel friendly 1 oz size. The full size is only 1.7 oz. but it won't fit in the 3-1-1 bag so this is perfect and a must have. It creates a smooth, even surface for your foundation and helps to lock it in for the day. 8. Kiehl's Creme de Corps - A body lotion is a must and I use this one often. It is also one of the only ones that I can find in a travel size. I actually usually get the bonus 2.5 oz size with a larger size like with my Nordstrom Anniversary Sale purchase, but it's also available alone. 9. Murad Rapid Results Set - I buy this set a few times a year because I really like the Essential-C Day Moisture SPF 30 for daytime use in the summer and this set includes a .33 oz size that's great for traveling. I also use the Rapid Age Spot and Pigment Lightening Serum everyday and the small .25 oz size that comes in this set is perfect too. 10. Algenist Complete Eye Renewal Balm - This is my favorite eye cream ever, and although this is full size, it actually travel friendly in it's full size at .5 oz. I just can't be without it. Every so often, I have found it in a mini size in sets and I've scooped it up, but I just don't travel without this one. If you have an eye cream that you love, check the size and fit it into your 3-1-1 bag. Have you been traveling this summer? What are you favorite travel size beauty products? Check out more great recommendations from my blogger friends.